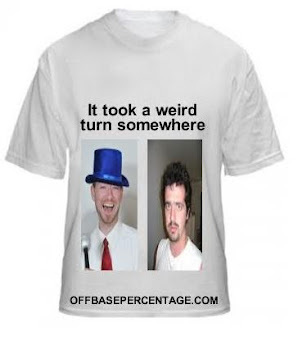 Off Base Percentage: How Good Is Nelson Cruz? The Rangers have a pretty good outfielder playing next to reigning AL MVP, Josh Hamilton. Nelson Cruz is seeing the ball decently to kick off the 2011 season. He's hit a home run in each of the Rangers' first four games and his .429/.500/1.286 slash line makes me "Barry Bonds giddy." Cruz has legit power but we've seen crazy Aprils before. Chris Shelton's parents don't even know where he's playing anymore. So this insane start begs the question; how good is Nelson Cruz? Cruz will turn 31-years-old in August so we pretty much have a finished product at this point. 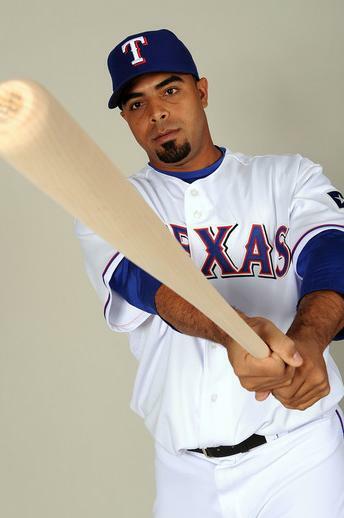 He mainly toiled in AAA until getting a regular spot in the Rangers outfield in 2009. Well, that's not entirely true. He managed 333 plate appearances in 2007 but put up a less than inspiring .235/.287/.384 line that only Brandon Wood is jealous of. In 2009, Cruz was given the keys to right field and did not disappoint. He hit 33 home runs, stole 20 bases, recorded a .260/.332/.524 line all while not wandering the field like a drunken hobo. He was poised for an even better 2010 if several trips to the disabled list didn't crush the hopes for my fantasy baseball team. Cruz only made it to the plate 445 times but raked for most of it. He went yard 22 times and put together a .318/.374/.576 line for a career best 5.1 WAR. This year, he looks like an MVP. If he can avoid another three DL stints, I expect his power to keep him in the MVP mix for 2011. PECOTA doesn't necessarily agree with me, projecting 28 homers and .275/.346/.516 over the course of 531 plate appearances. I'm a tad more optimistic (I know, strange for me) and think he'll be closer to 34 bombs and a .360-ish OBP. Cruz should be able to keep this production up for at least a few more season especially with the advantage of playing half of his games in Arlington. But a Carlos Lee fall from productivity wouldn't surprise me either. Luckily for the Rangers, Cruz hits arbitration for the first time after this season. While he's in for a hefty raise, they don't need to shell out a 6-year, $100 million contract unless Nolan Ryan goes crazy from Mad Cow disease which I assume still exists in Texas. Oh, and to answer the question, Nelson Cruz is pretty good. I'd put his Fangraphs page on my refrigerator. What? I can't be the only person who does that, right?